A federal grand jury handed state Sen. Carlos Uresti, D-San Antonio, two indictments Tuesday: one for his involvement in a now-bankrupt company accused of misleading investors and another for alleged bribery surrounding a government contract. State Sen. Carlos Uresti, accused of misleading a former client who invested in a company in which Uresti has a financial stake, was indicted Tuesday by a federal grand jury on 11 charges over his involvement in the alleged investment Ponzi scheme, and he also faces a separate indictment alleging bribery surrounding a government contract. In the first indictment, the federal grand jury charged Uresti, a San Antonio Democrat, with eleven counts of wrongdoing over his complicated saga involving a now-bankrupt company. The company, FourWinds Logistics, purported to sell sand used in hydraulic fracturing, a process that extracts oil and gas from shale rock, but has been accused of misleading investors and grossly misspending funds. The grand jury indicted Uresti on one count of conspiracy to commit wire fraud; one count of conspiracy to commit money laundering; five substantive counts of wire fraud; two counts of securities fraud; one count of engaging in monetary transactions with property derived from specified unlawful activity; and one count of being an unregistered securities broker. A separate indictment centered on a contract to provide medical services to a correctional facility in West Texas. That indictment alleges that a colleague of Uresti’s, Vernon C. Farthing III, paid Uresti $10,000 per month as a marketing consultant and that half of the money was given to an unspecified Reeves County official to win over his vote to award the contract to Farthing’s company. It was the culmination of a 10-year scheme to commit bribery and money laundering, prosecutors argued. In a prepared statement, Uresti said he would plea not guilty to the charges. "I am hard at work representing District 19 in the 85th Legislative Session," he said. "The charges against me are groundless and I look forward to proving my innocence in a court of law at the appropriate time." It was the frack sand case that received the most scrutiny in recent months. A lengthy investigation published by the Express-News in August first detailed the involvement of Uresti, a personal injury attorney, in the company and fraud allegations it faces. FourWinds’ supposed intent was to buy sand and sell it at a markup to oil and gas companies, but investors have accused the company’s leadership of misrepresenting its financial health and spending their money on frivolous, personal expenses. It now faces millions of dollars in claims from investors and other companies. Uresti’s alleged wrongdoings trace back to one of his previous legal clients. Uresti represented Denise Cantu in a wrongful-death case after Cantu’s 13-year-old daughter, four-year-old son and two friends were killed in 2010, when a tire on her SUV blew out, causing the vehicle to roll over. Cantu received $900,000 in a settlement, but she said she lost most of the money after she invested it in the now-bankrupt FourWinds firm at Uresti’s suggestion. Cantu has said she was not initially aware that Uresti would get a piece of her investment, though Uresti has suggested otherwise. With allegations of serious financial mismanagement detailed in bankruptcy court, the FBI last year opened an investigation. Federal agents raided Uresti’s law offices in February in connection to the case. Documents in the company’s bankruptcy proceedings list Uresti as owner of a 1 percent stake in FourWinds. Also, the company granted Uresti a $40,000 loan in June of 2014, and hired him to perform legal services, the documents show. At least four former FourWinds employees have now been indicted for their involvement in the company: chief executive Stanley Bates; Eric Nelson, the former marketing director; Shannon Smith, who held a 48 percent stake in the company; and Laura Jacobs, who worked as its comptroller. Gary Cain, a company consultant, was also indicted. 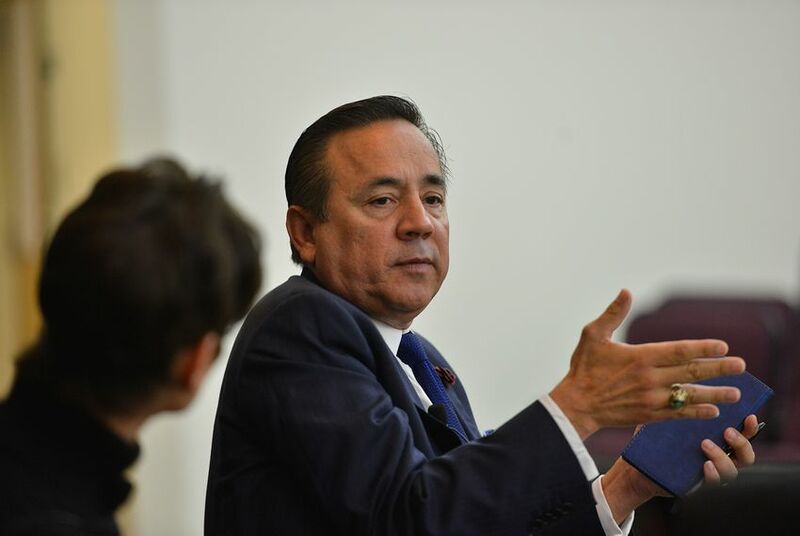 Three months after the Express-News story, Uresti coasted to re-election, winning his San Antonio seat with 56 percent of the vote against Republican and Libertarian challengers. Uresti is among the Legislature's most powerful Democrats. He is vice chair of the Health and Human Services committee and sits on three other high-profile committees: Finance, Education and Veteran Affairs & Border Security. Uresti’s indictments put Texas Democrats in an awkward position. The fraud charges bear similarity to another high-profile case: that of Texas Attorney General Ken Paxton, a Republican. Paxton is similarly charged with misleading investors and failing to register as a securities broker. Uresti could face up to 20 years in federal prison if convicted of the fraud-related charge, and the money laundering charge carries prison time of up to 10 years. If convicted of being an unregistered securities broker, Uresti could spend up to 20 years in federal prison. In the Reeves County case, Uresti could face up to five years in federal prison if convicted of conspiracy to commit bribery, and up to 20 years if convicted of the money laundering charge. Uresti is expected to appear before U.S. Magistrate Judge Henry Bemporad at 11 a.m. tomorrow in San Antonio. Three members of the Texas Legislature, all Democrats, easily won their re-election bids in November despite a cloud of ethics questions hovering over their campaigns. More than two dozen former elected officials convicted of felonies may be receiving taxpayer-funded retirement pay. But state law keeps the details secret.